"I just wanted to say "THANK YOU" for everything. I could not have asked for our Mehndi function to go any better. You were very professional and courteous and your artwork and design was very neat and attractive. My daughter’s Mehndi was awesome! The feedback and comments from the all the guests that also had their hands or feet done was all very positive and complimentary. You were awesome to work with and things got done quickly and efficiently considering the large number of people who had Mehndi work done. I honestly have no complaints or any suggestions for improvement. Thanks again for an awesome job! "Unnati does amazing henna art for all occasions. We've used her several times and are always recommending her to our friends and family. You won't be disappointed!" "Unnati provided outstanding service as both a mehndi artist and professional dresser for my wedding, and I highly recommend her. Her mehndi designs are beautiful and she is very quick; she applied mehndi to almost 100 guests during our Garba function. 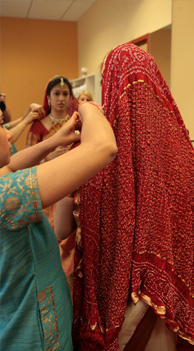 She also dressed me, my mom, aunts, and bridesmaids in our saris before the Hindu wedding ceremony. Unnati is very talented, patient, dependable, organized and her services are quite reasonable."